form a road map to ensure a successful deployment. have learned and advice to companies considering adopting this new technology. AirGon’s Loki is a direct geopositioning system that is compatible with DJI’s Inspire 2 drone, Phantom 4 Pro drone, and it’s m2xx series of drones, as well as generic drones with digital single lens reflex cameras. A direct geopositioning system can make your drone mapping projects significantly more cost-effective and accurate due to its ability to reduce, or sometimes even eliminate the need for ground control. 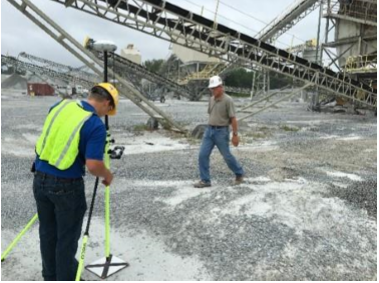 Direct geopositioning systems work by very accurately monitoring the position of a drone, synchronizing the position to camera events and recording information that can be used to provide a priori estimates of the camera location for each image captured. This paper will provide you with a report on the accuracy of using Loki in an actual data collection scenario. In mid-November of 2017 we flew a limestone mine site with the goal of generating 1-foot topographic contours (“topo”) to be used for planning operations. For comparison, we luckily have 1-foot contours available that were produced in January of 2017 from high-accuracy airborne topographic LIDAR. These data give us the opportunity to explore the vertical conformance of the drone derived point cloud in areas of undisturbed ground throughout the project.